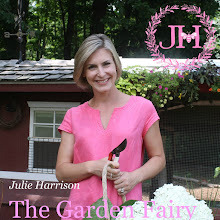 Julie The Garden Fairy: Career Change? Yesterday went down as a "Top 20" in the life of Julie Harrison! As many of you know, every Monday I do a brief story for WFSB's Better Connecticut on Gardening. It's a magazine style TV show which covers everything Connecticut- travel destinations, hot news, beauty trends, local happenings etc... Kara Sundlun and Scot Haney are the co-hosts of the show, but with Kara out of the country, her seat needed to be filled. I was both thrilled and honored to be asked to do it! Scot is always fun to work with, but to do the entire one hour show with him was just a blast! I had a lot of laughs, met some great people and tasted some delicious cupcakes! 2. I neglected to mention that besides eating ice cream this weekend I also: had lunch with a special friend, Hillary, at Max Burger. My husband Chip and daughter Elle and I were treated to a fabulous and relaxing dinner with the Scranton family. I went shopping and worked in the garden. In a nutshell, there was actually a lot of eating going on this weekend, but I did do more than eat ice cream! 3. Scot did not smoke the Japanese Maple leaf, so I cannot follow up with his reaction on the effects of that. Doing a TV show is fast paced and fun. I would certainly entertain any offers to do it again! Does anyone have any New York hookups for me at NBC? Maybe I can take over for Ann Curry? every Monday!!! I LOVE them!